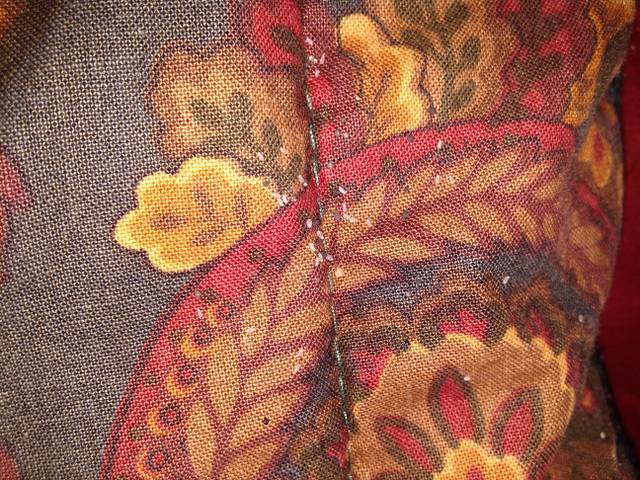 As you can see from the picture, Bedbug eggs are tiny, and white. They are shaped LIKE GRAINS OF RICE, but only a third the size of rice. If you see bedbug eggs on your bedding, on mattress in seams and corners, or inside furniture cushions, it’s time for professional BED BUG CONTROL! Bedbugs in Arizona are a very common problem. And getting a bedbug infestation has nothing to do with cleanliness… You can pick them up in the nicest hotels! Bedbugs are pro’s at HITCHHIKING and spread VERY easily. Join 1000′s of HAPPY CUSTOMERS living Bed Bug FREE in Phoenix AZ & all surrounding cities! Protect your mattress, box springs, and pillows with Bed Bug Protection for Mattress . Providing Pest Control in Mesa, Phoenix, Scottsdale, Chandler, Glendale, Gilbert, Queen Creek, Maricopa, & surrounding areas.